The Silla dynasty, emerging in the southern half of the Korean Peninsula during the third century CE, played a major role in developing Korea's cultural tradition. Based upon aristocratic "true bone" and "hallow bone" rank, an aristocratic class of rulers arose that brought splendor to Silla society. Gyeongju emerged as a city of wealth and power. Silla military developed tactics and weapons, including the famed Hwarang horse-back Buddhist warriors, that overpowered their neighbors and won the respect of China. Silla's welcome to Buddhism and Confucianism, blending with the already present Shamanism, created a rich spiritual culture bedecked with beauty and knowledge. Silla's traditions continued into the Unified Silla dynasty upon successfully conquering Goguryeo and Baekje. Silla (57 B.C.E. - 935 C.E. ), occasionally spelled Shilla, numbered among the Three Kingdoms of Korea. Beginning as a chiefdom in the Samhan confederacies, Silla allied with China, eventually conquering the other two kingdoms, Baekje in 660 and Goguryeo in 668. Thereafter, the Unified Silla occupied most of the Korean Peninsula, while the northern part of Goguryeo re-emerged as Balhae. This article deals with Silla to the unification of the Three Kingdoms. Unified Silla and Balhae fell to Goryeo by 935. From founding until becoming a full-fledged kingdom, Silla's name has been recorded with various Hanja (Chinese characters) phonetically approximating its native Korean name: 斯盧 (사로, saro), 斯羅 (사라, sara), 徐那(伐) (서나(벌), seona(beol)), 徐耶(伐) (서야(벌), seoya(beol)), 徐羅(伐) (서라(벌), seora(beol)), 徐伐 (서벌, seobeol). In 503, King Jijeung standardized the characters 新羅(신라), which in Modern Korean read together as Silla; Korean /s/ is often palatalized before /i/, so that the actual phonetic result tends to sound more like "Shilla" to the ear of an English speaker. The original meaning of the native word may have been "capital city," although linguists advance various speculations. The direct descendant of the word "Seora-beol," the name of the Silla capital, appears in the Late Middle Korean form Syeobeul (셔블) meaning "royal capital city," which changed into Syeowul (셔울), and finally resulted in Seoul (서울) in the Modern Korean language. Today, "Seoul" is the name of the present capital of South Korea, a city previously known as Hanseong or Hanyang. The name of either Silla, or its capital Seora-beol, became widely known throughout Northeast Asia as the ethnonym for the ancestors of the medieval and modern Korean nation, appearing as "Shiragi" (新羅、しらぎ) or "Shiragi-bito" (新羅人, literally "Silla-people") in the language of the Yamato Japanese and as "Solgo" or "Solho" in the language of the medieval Jurchens and their later descendants, the Manchus. Silla, also has been referred to as Gyerim(鷄林, 계림), literally “chicken forest,” a name that has its origins in the forest near the Silla capital where by legend the state‘s founder hatched from an egg. During the Proto-Three Kingdoms period, the city-states of central and southern Korea grouped into three confederacies called Samhan. Silla began as Saro-guk, a statelet within the 12-member confederacy called Jinhan. Saro-guk consisted of six villages and six clans. 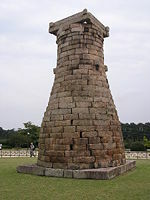 According to Korean records, King Bak Hyeokgeose founded Silla in 57 B.C.E., around present-day Gyeongju. Legend says that Hyeokgeose had been hatched from an egg laid from a white horse, and when he turned 13, six clans submitted to him as king, establishing Saro (or Seona). the progenitor of the Park (박) clan, He gave birth to one of the most common family names in Korea. 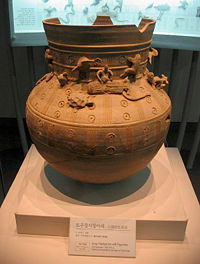 the Samguk Sagi, a twelfth century Korean history has the earliest recording of that date. Archaeological evidence indicates that, while a polity may have been established even earlier than that in the Gyeongju region, Silla existed in a pre-kingdom state. The author of the Samguk Sagi, Kim Bu-sik, probably attempted to legitimize Silla rule by giving it historical seniority over its rival kingdoms Baekje and Goguryeo. In the early years, leadership rotated among the three strongest clans, Bak, Seok, and Kim. By the second century, Silla existed as a distinct state in the southeastern area of the Korean peninsula. Expanding its influence over neighboring Jinhan chiefdoms, Silla still existed as no more than the strongest city-state in a loose federation through the third century. To the west, Baekje had centralized into a kingdom by about 250, conquering the Mahan confederacy. To the southwest, the Gaya confederacy replaced the Byeonhan confederacy. In northern Korea, Goguryeo, a kingdom by about 50 C.E., destroyed the last Chinese commandery in 313, and had grown into a threatening regional power. King Naemul (356–402) of the Kim clan established a hereditary monarchy, eliminating the rotating power-sharing scheme, and the leader's now truly royal title became Maripgan (from the native Korean root Han or Gan, "leader" or "great," which was previously used for ruling princes in southern Korea, and which may have some relationship with the Mongol/Turkic title Khan). In 377, it sent emissaries to China and established relations with Goguryeo. Facing pressure from Baekje in the west and the Japanese state of Wa in the south in the later part of the fourth century, Silla allied with Goguryeo. However, when Goguryeo began to expand its territory southward, moving its capital to Pyongyang in 427, Nulji was forced to ally with Baekje. By the time of King Beopheung (514–540), Silla was a full-fledged kingdom, with Buddhism as state religion, and its own era name systems. 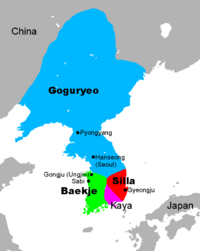 Silla absorbed the Gaya confederacy during the Gaya–Silla Wars, annexing Geumgwan Gaya in 532 and conquering Daegaya in 562, thereby expanding its borders to the Nakdong River basin. King Jinheung (540–576) established a strong military force. Silla helped Baekje drive Goguryeo out of the Han River (Seoul) territory, and then wrested control of the entire strategic region from Baekje in 553, breaching the 120-year Baekje-Silla alliance. 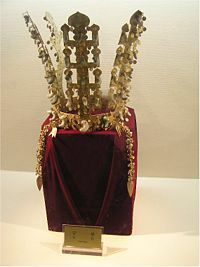 The early period ended with the demise of the “hallowed bone” (seonggol) rank with the death of Queen Jindeok. In the seventh century Silla allied itself with the Chinese Tang dynasty. In 660, under King Muyeol (654-661), Silla subjugated Baekje. In 668, under King Munmu (King Muyeol's successor) and the General Kim Yu-shin, Silla conquered Goguryeo to its north. Silla then fought for nearly a decade to expel Chinese forces on the peninsula intent on creating Tang colonies there to finally establish a unified kingdom as far north as modern Pyongyang. The northern region of the defunct Goguryeo state later reemerged as Balhae. Silla's middle period is characterized by the rising power of the monarchy at the expense of the jingol nobility. This was made possible by the new wealth and prestige garnered as a result of Silla's unification of the peninsula, as well as the monarchy's successful suppression of several armed aristocratic revolts following early upon unification, which afforded the king the opportunity of purging the most powerful families and rivals to central authority. Further, for a brief period of about a century from the late seventh to late eighth centuries the monarchy made an attempt to divest aristocratic officialdom of their landed base by instituting a system of salary payments, or office land (jikjeon 직전, 職田), in lieu of the former system whereby aristocratic officials were given grants of land to exploit as salary (the so–called tax villages, or nogeup 녹읍, 祿邑). From at least the sixth century, when Silla acquired a detailed system of law and governance, social status and official advancement were dictated by the bone rank system. That rigid lineage-based system also dictated clothing, house size and the permitted range of marriage. Since its emergence as a centralized polity Silla society had been characterized by a strict aristocratic makeup. Silla had two royal classes: "sacred bone" (seonggol 성골 聖骨) and "true bone" (jingol 진골 眞骨). 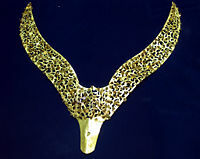 Up until the reign of King Muyeol that aristocracy had been divided into "sacred bone" and "true bone" aristocrats, with the former differentiated by their eligibility to attain the kingship. That duality had ended when Queen Jindeok, the last ruler from the "sacred bone" class, died in 654. The numbers of "sacred bone" aristocrats had been decreasing, as the throne conferred title only to those whose parents both had "sacred bones" stature, whereas children of a "sacred" and a "true bone" parent earned the title "true bones." Following unification Silla began to rely more upon Chinese models of bureaucracy to administer its greatly expanded territory. That marked a change from pre-unification days when the Silla monarchy stressed Buddhism, and the Silla monarch's role as a "Buddha-king." Increasing tensions between the Korean monarchy and aristocracy marked another salient factor in post-unification politics. Gyeongju served as the capital of the Silla kingdom. A great number of Silla tombs exist in the centre of Gyeongju. Silla tombs took the form of a stone chamber surrounded by a soil mound. A great number of remains from the Silla period exist throughout Gyeongju. was UNESCO added the historic area around Gyeongju to the World Heritage list in 2000. 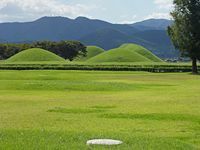 Much of area has also been designated a national park,Gyeongju National Park. The Bronze Bell of King Seongdeok the Great attracts a large number of tourists. A legend surrounds the distinctive sound produced by the bell, the Emile Bell. Cheomseongdae, built during the reign of Queen Seondeok (623-647), is the oldest extant astronomical observatory in East Asia, while some disagree on its exact functions. Muslim traders brought the name "Silla" to the world outside the traditional East Asian sphere through the Silk Road. Geographers of the Arab and Persian world, including ibn Khurdadhbih, al-Masudi, Dimashiki, al-Nuwairi, and al-Maqrizi, left records about Silla. Silla formally adopted Buddhist in 527 under King Beopheung, though Buddhism had been present for over a century making inroads into the native populace. The Buddhist monk Ado first taught Buddhims in Silla when he arrived from Goguryeo in the mid fifth century. According to legend, the Silla monarchy determined to adopt the faith by the martyrdom of the Silla court noble Ichadon, executed for his Buddhist faith by the Silla king in 527. Legend says that his blood flowed the color of milk. Buddhism played an important role in shaping Silla society of the late early period. From King Beopheung and for the following six reigns Silla kings adopted Buddhist names and came to portray themselves as Buddha–kings. 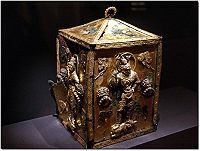 Buddhism in Silla, more so than in the case of Baekje and Goguryeo, received officially sponsorship from the throne. Its state–protection function has been emphasized in histories of Silla. 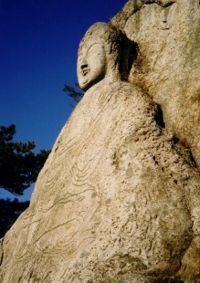 The Hwarang corps, an elite corps of youthful warriors that played a central role in Silla's unification of the peninsula, had strong connections to Buddhism, particularly the worship of the Maitreya Buddha. The late early period of Silla saw Buddhism‘s apogee there. Monks built a great number of temples, often financed and sponsored by high ranking nobility, the most notable being Hwangyongsa, Bulguksa, and Seokguram. Hwangyongsa (Imperial Dragon) temple in particular emphasized the power of the monarchy and Buddhism‘s role in state protection and aggrandizement. The nine stories of its wooden pagoda, perhaps the tallest man-made structure in East Asia of the period, allegedly symbolize the nine nations destined to submit to Silla rule. Silla attached great importance to the pagoda, building them of stone as well as wood. With Silla unification Buddhism came to play a less perceptible role in politics as the monarchy attempted to adopt Chinese Confucian institutions of statecraft to govern an enlarged state and to curb the power of the aristocratic families. Nevertheless, Buddhism still enjoyed a central place in larger Silla society. Hundreds of Silla monks traveled to Tang China in search of education and for the procurement of much needed Buddhism sutras. Thousands of remnant Buddhist stone figures and carvings, mostly importantly on Namsan reflect Silla‘s strong Buddhist character. ↑ 성골 [聖骨]. Empas Encyclopedia. Retrieved August 29, 2006. Metropolitan Museum of Art: Bottle with flattened side..
Metropolitan Museum of Art: Standing Buddha. This page was last modified on 18 September 2015, at 16:51.